Stop for a minute and consider the car-buying experience from the customer’s point of view. How do your customers think about you? Imagine what they see when they hear the phrases “car salesperson” or “used car dealer.” It’s not a pretty picture, is it? Decked out in loud and often mismatched clothing. On you like a shadow the minute you walk on the lot and pushing you to buy right away—not the car you want, but the car they’re looking to move off the lot. Thanks to years of negative portrayals in movies and TV, the average car buyer looks at car salespeople as the enemy, and gets genuinely stressed at the prospect of buying a car. Nobody wants to be that disliked, so most dealerships have gone too far in the other direction—you can walk around the lot and honestly wonder if anyone works there. In an attempt to avoid the negative sales stereotypes and make customers not feel pressured, they leave customers alone, letting them browse at their leisure. But what if you have come in ready to buy, but first needing to ask some questions or look for some additional information? How does this help you? With a big decision like buying a car, you want to be armed with as much information as possible before making a final decision. But to get that information, customers need the expertise and product knowledge only you can provide. When thinking about these options, where does your showroom experience fall? Where should it fall? You might still be thinking that you don’t want to fall into the first category—you want to help your customers, not annoy them! But falling into the second group is much worse—in an attempt to make your customers feel no pressure, you don’t give them the attention they actually crave or the answers they need. 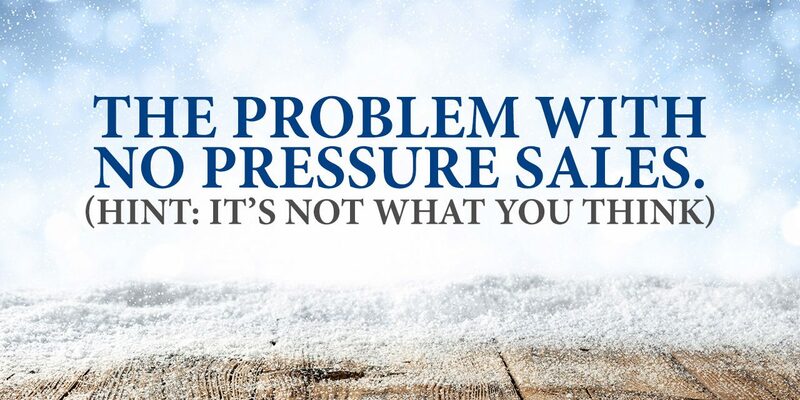 No pressure often means no sales! You should create your own category between these two—one that doesn’t think in terms of pressure, but instead considers the needs of your customers and how best to solve them. People come to dealerships motivated to buy and by asking them the right questions, you can discover what is holding them back from making their ultimate purchase. Think about it this way—people only consider it pressure if they feel like they are being forced to do something they don’t want to do. If you engage your customers with intelligent questions that show an interest in their needs and then demonstrate how your expertise can provide the ultimate solution for them, you are providing a valuable service. You give buyers what they want and there’s no pressure in that—just relief! PreviousHere’s A Question: Are You Asking The Right Questions?